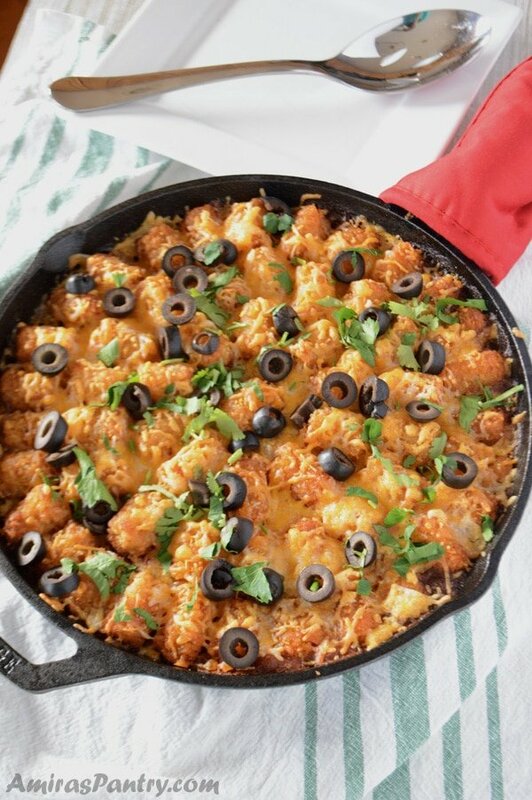 Taco tater tot casserole is an extremely delightful dish, that bursts with flavors, textures and above all easy to make. A formula that is a winner in my kitchen. 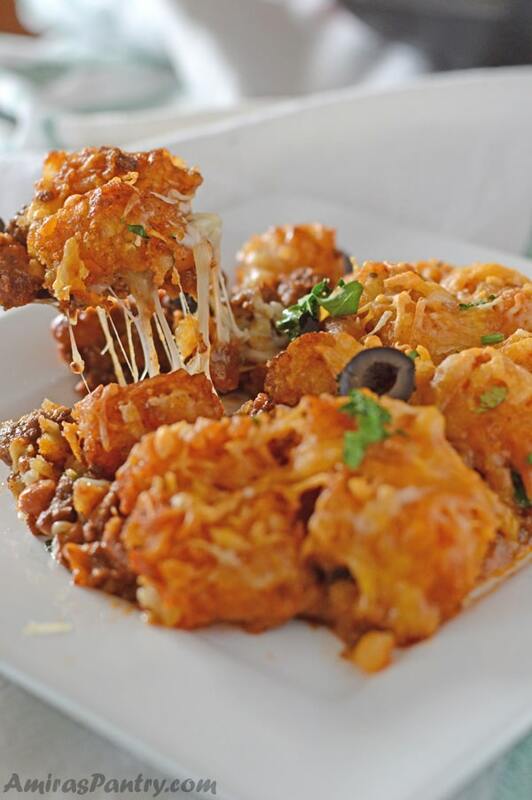 Ground beef tater tot casserole recipe that is a beautiful and practical recipe for those crazy busy weeknights. 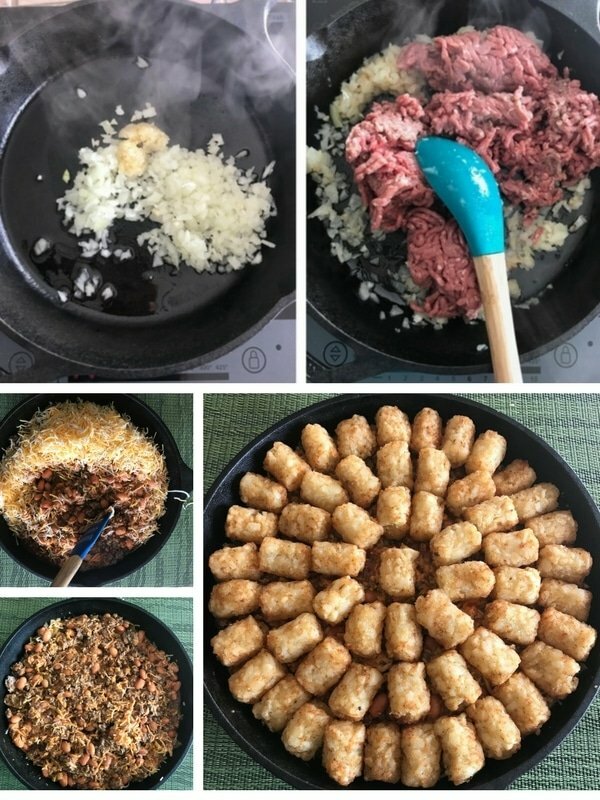 Flavored ground meat with cheese, beans and green chiles simmered in enchilada sauce and covered with crispy tater tots. 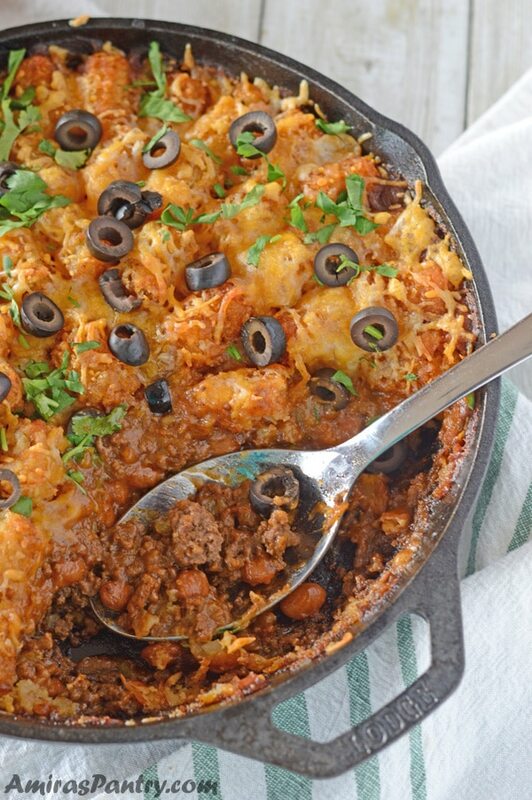 There is nothing about this casserole that isn’t good. Motherhood is tough. Parenting is tough. And I think it is getting tougher and tougher with each generation. There are days when I want to give up, surrender and days that I really feel this is not for me, I am doing it all wrong. It is hard, super hard especially with kids being teenagers!. It is messy. Endless chores. Loads and loads of laundry and dishes. Repeating myself over and over, hoping that my words will stick and they will remember something. But, at the end of the day, when they come to hug you, when you see them sound asleep in their beds, your heart melts and you realize the blessings and the joy they bring. I was talking to one of my friends and I said, I will try my best not to get angry, although I still do. I will try to stay calm, and just give advice but really… what will be will be. I will also pray and pray and keep praying for them to be the best, loving, happy creatures in this world. When I saw people talking about gun control and watch parents who lost their kids in those horrible tragedies, I stop and think and imagine. I stop yelling, and think can this happen to me? and imagine my self in this situation. So heart breaking. I end up with one conclusion, I will not care that much about messy rooms, I will not put their grades and GPA first, I love my kids do fiercely, even when they misbehave and I should show them that. 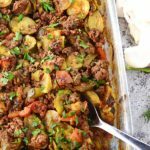 Now, after these thoughts about motherhood, let’s see how to make your kids happy with just this simple casserole. 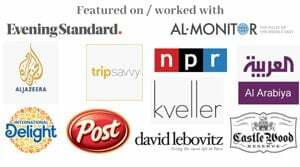 Here’s what you do. 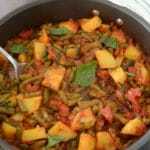 In a skillet, saute onions and garlic, add meat and brown then drain excess fat. Add taco seasoning, chiles, beans (I’ve used pinto but any kind will work), enchilada sauce and some cheese. Mix everything well together. If you are using a pan that can go directly in the oven, recommended of course who wants more things to wash anyways?! Arrange tater tots in around and bake until top is golden brown. Add some extra cheese and pop it again in the oven until cheese melts and everything is sizzling and bubbly. 1 (1 oz) package taco seasoning mix. 1 (4 oz) can Chopped Green Chiles. 1 (15 oz) can black or pinto beans, rinsed and drained. 3 cups shredded Mexican blend cheese. 1 (28 oz) package frozen tater tots. 1 (10 oz) can Red Enchilada Sauce. n a cast iron skillet over medium heat, sauté onion and garlic in oil. Add beef and cook until no longer pink. Drain the fat then return to stovetop. Add the green chiles, taco seasoning mix, enchilada sauce, beans, and 2 cups of the cheese. Stir together to combine. Arrange tater tots on top of the mixture in a single layer. Bake uncovered for 30-40 minutes or until tater tots are nice and crispy. 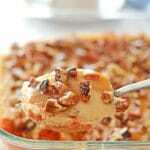 Sprinkle the remaining 1 cup of cheese on top and place back in the oven for 2-3 minutes or until cheese has melted. 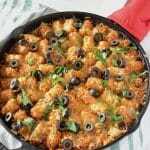 Top with olives, cilantro, when serving if using. 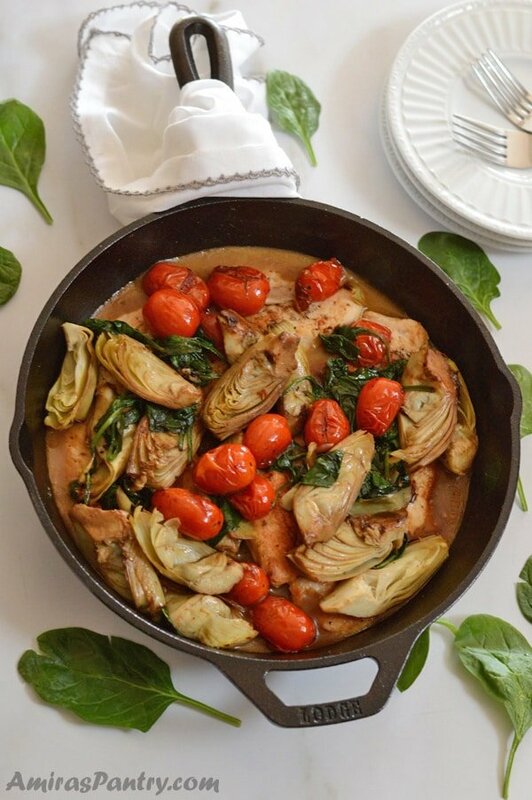 If you do not have a cast iron, prepare in a skillet then pour mixture into the prepared 9x13 pan. 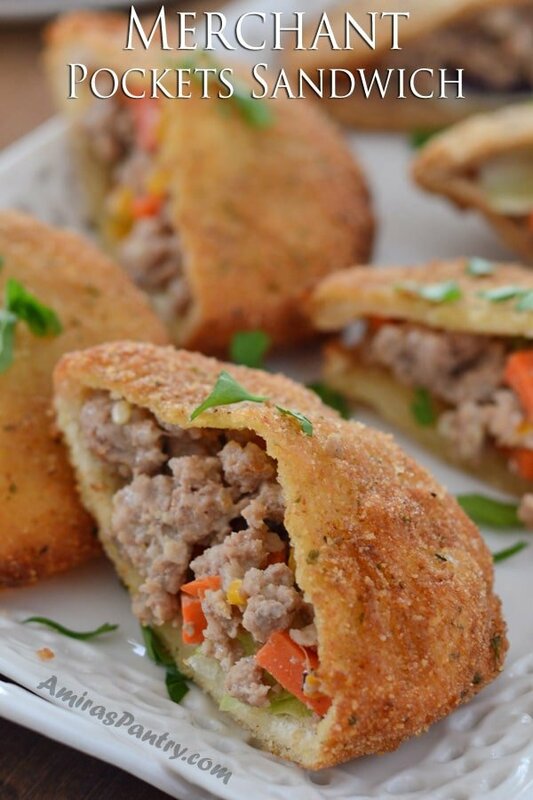 A fabulous quick recipe. I am craving it right now. I can’t remember when I had tater tots last time. Yes keep loving them and serve them this and all will be alright. What a fun dish! 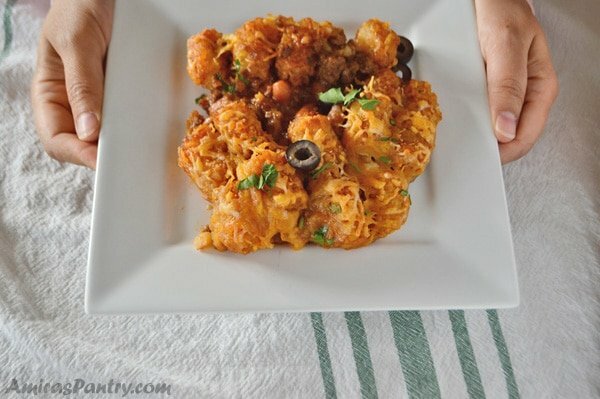 I haven’t had tater tots in ages, and this is such a creative way to use them. And tasty! This is just loaded with flavor. Thanks!